Kevyn Aucoin, makeup artist and friend of Tori, passed away on Tuesday, May 7, 2002 in New York from complications caused by a pituitary brain tumor. He was only 40 years old. I was extremely sad and shocked to hear this. This was first confirmed by a news items on etonline.com. Kevyn's talent was enjoyed by many celebrities, including Tori. He did the characters in the Strange Little Girls CD booklet, as well as Tori's makeup for numerous TV appearances. He was immensely talented and will be deeply missed. My thoughts go out to his family and friends. He touched the hearts of so many, and it is so tragic to lose such a person when he was so young. Tori's management on May 9, 2002 sent me this quote from Tori about the death of her friend Kevyn Aucoin. You will see this on ToriAmos.com as well. "For those like me who loved Kevyn the person, the heart now weeps as if made of water color. Earth has lost yet another light, but perhaps, he has joined the masters who paint our sunsets." Kevyn Aucoin's book "Face Forward"
Kevyn's books "Making Faces" & "The Art of Makeup"
Kevyn Aucoin, on the far right, at Tori's wedding in 1998. To find out more about Kevyn and to read some news articles about his death, use the following links. The July 22, 2002 issue of New York magazine included a cover story on Kevyn Aucoin about his life. (You can read this entire article online at newyorkmag.com.) Tori is referenced 3 times. On pg. 23 there are photos of Kevyn with celebrity clients, and Tori is pictured on this page. Later in the article, it mentions that he and his partner talked about Tori when they first met; the last Tori mention is that he and his partner once stayed at Tori's house in Florida for vacation. Here are comments on the article from Alex: "The article is interesting if you are a fan of Kevyn's, but it is also very sad. Apparently he was in a lot of pain for quite some time and had become heavily addicted to pain killers, which partly lead to his death. He was also in danger of losing clients because his addiction had gotten so out of hand. I wondered how much of this Tori was aware of since it wasn't that long ago that he did the Strange Little Girls photo shoots with her. The article also shows that the media was fairly quiet about the details of his death and illness, which I think is a show of respect. I just find it very sad that someone who gave so much happiness to others was in so much pain, and I will really miss seeing the new faces he would have painted on Tori." Read an amazing story about Kevyn Aucoin and Tori from Toriphile Casey Stratton, who is an singer/songwriter himself. This amazing personal account is worth reading and reveals what kind of person Kevyn was. Follow the link or look further down on this page. On May 14, 2002, The Style Network, a cable network created by the same people who created the E! network, will broadcast a special on Kevyn Aucoin called Kevyn Aucoin: A Style Tribute, which will be a half hour look at his life. The special premieres May 14, 2002 at 10 p.m. ET/PT. "Yes, he was a master painter, but it was what he did in the conversation that made your inside glow, and helped you find the part of you that had grace or humor," said the singer Tori Amos, whose daughter was Mr. Aucoin's godchild. "So he made me up, and even though I could barely roll over, he took pictures of me. He captured a simple moment in our lives and turned it into something beautiful and meaningful. And he made me feel beautiful in the process." "This was a man who loved women," Ms. Amos added, "even the ones who weren't good  the nice-seeming people who were closet Cruella De Vils. I would watch him working on a person and I'd think, 'Yikes, I wouldn't want to leave my Alsatian with her.' But by the time he had told her a few jokes and finished his Baby Jane imitation, the walls of rigidity and insecurity would be broken down." You can read the full article online at the New York Times web site or below on this page. Thanks to Woj, Alicia Gordon and Sean Robinson for letting me know about this. A good article on Kevyn Aucoin and his legacy can be found on CNN.com. It was posted on May 11, 2002. One of the best online obituaries that have been sent to me was one from the Los Angeles Times. You can read it at latimes.com, or at the bottom of this web page. It includes a place where people can make donations in his name. "Donations can be made to the Hetrick Martin Institute, a New York center for gay youth, at www.hmi.org on the Internet." Thanks to Richard Handal for sending me that. Kevyn's official web site at kevynaucoin.com. If you look at Kevyn's column, you will see a touching message about him and his last written message on the web site, which is extremely poignant considering what he says. See the Kevyn Aucoin page at hereinmyhead.com. 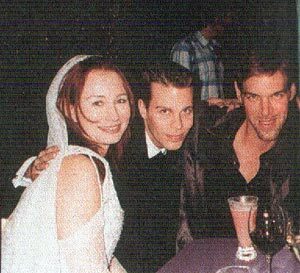 Here you will see a large amount of information about Kevyn Aucoin and his relationship with Tori Amos. You can see quotes from both of them about each other, examples of his makeup work with Tori, details about Kevyn's books, and some great photos. There is a nice page for Kevyn at The Little Pink Pele Hotel web site which contains many more photos of Tori and others that highlight his incredible work. An May 8, 2002 article from the Guardian newspaper in the U.K.
Associated Press Article at Yahoo! News from May 8, 2002. I just watched Rosie O'Donnell's show and she mentioned Kevyn very briefly. She said he was sitting about a row away from her at Liza Minelli's wedding back in March, and that nobody had any idea he was ill. Am sure his passing is a great shock to the show-biz community as a whole as he's done makeup for virtually everyone there. MSNBC article from May 8, 2002. Article from pagesix.com from May 8, 2002. KEVYN AUCOIN, the famed makeup artist who touched the faces and hearts of millions, died Tuesday from complications relating to a pituitary brain tumor in New York. He was 40 years old. Aucoin was the top choice for many key industry faces from BRITNEY SPEARS to JULIA ROBERTS, and certain celebrities, such as CHER, OPRAH and JANET JACKSON, insisted on Aucoin's services. A prolific and successful artist, Aucoin perfected faces for more magazine covers than any other professional in his field, including Harper's Bazaar, Vanity Fair, Glamour and Rolling Stone. Makeup artist Kevyn Aucoin, who made up some of the most beautiful faces in Hollywood and then put his techniques in the hands of millions of women through best-selling books, TV appearances and a magazine column, died Tuesday at Westchester Medical Center in New York from complications relating to a pituitary brain tumor. He was 40. Gwyneth Paltrow, Nicole Kidman, Julia Roberts, Barbra Streisand and Jennifer Lopez--to name a few--trusted Aucoin to make them look their best. Commanding up to $6,000 a day for his services, he was booked months in advance for awards shows. "Kevyn was a true artist and a loving and special friend," pop singer Janet Jackson said Tuesday of Aucoin, who worked with her on album covers, magazine shoots and concert tours. "Through his craft, he wanted to open the hearts and minds of all people, regardless of race or sexual preference." His work graced countless fashion magazines and designer runways, and he wrote best-selling beauty books "The Art of Makeup" (Harper Collins, 1994), "Making Faces" (Little, Brown, 1997) and "Face Forward" (Little, Brown, 2000) and wrote a monthly column for Allure, a beauty magazine. He viewed makeup as enhancement, not ornament, and refused to tout one product as a "must-have," saying that the strategy was just a ploy by the cosmetics industry to get women to spend money. "His importance to the beauty industry cannot be overstated," Vogue beauty director Amy Astley said from New York. "The idea of a celebrity makeup artist crystallized with him. There were others before him like Max Factor, but he was the ultimate. No one did it better and no one ever will. His clients were the starriest stars and he had a rapport with them that is unparalleled in his field. They trusted him and they loved him." But even as he hobnobbed with supermodels, rock stars and celebrities, Aucoin embraced the beauty in everyday women. He appeared on "The Today Show" and "The Oprah Winfrey Show," teaching women how to enhance their inner beauty. "I wish I could get on a bus and tour America because I love women and I would love to be able to do that," he told The Times in 1995. In his books, he demonstrated how a celebrity could be transformed into another familiar face--he turned Lisa Marie Presley into Marilyn Monroe. He also performed makeovers on average women--secretaries, friends and family. "He fulfilled in the faces of women their fondest dreams for themselves," photographer Irving Penn said from his studio in New York. Throughout his career, Aucoin tried to promote individuality and a feminist viewpoint within a field notorious for imposing a uniform standard of beauty. In 1984, he helped create the shades for The Nakeds, a pioneering neutral color collection based on skin tones and launched by Revlon's Ultima II. "It may not seem like it, but it was a powerful moment. Before, there were makeup lines for white women and others for black women. But he worked to design makeup for all skin tones. The idea was to empower a woman by revealing her natural beauty, and not to cover her up with layers of product," Allure editor-in-chief Linda Wells said from New York. "His biggest influence was his celebration of individual attractiveness and the quirks and imperfections that make people different." Described by friends as "teddy bear-like," the 6-foot, 4-inch Aucoin was outspoken about gay rights, gun control and race relations. He told Time magazine in October 2000, "If all it says on my gravestone is 'DID GOOD LIPSTICK,' I'd rather it say nothing at all." Aucoin was as surprised as anyone about his fame and fortune, and was fond of saying, "I'm just a kid from Louisiana." He was born on Valentine's Day 1962 in Shreveport and adopted a month later by a family who raised him and three other adopted siblings in Lafayette. He realized at an early age that he was gay, and his childhood was traumatic as a result. He took refuge in fashion magazines, spending hours making up his younger sister Carla to look like a model. At 15, he dropped out of high school after two classmates tried to run him over with a car. In 1983, he moved to New York City and enrolled in beauty school. Within a year, he was hired by photographer Steven Meisel to work with Meg Tilly on a Vogue shoot. Two years later, he was a legend in the industry, working with models such as Cindy Crawford and Kate Moss and celebrities including Tina Turner and Cher. During the 1990s, when peers such as Vincent Longo and Laura Mercier were launching their own makeup lines, he resisted, saying that he didn't want to lend his name to a major cosmetics company that would only offer him 5% of the profits. Last year, he launched a Web site--kevynaucoin.com--that features a personal profile and photos as well as makeup tips. His newest project was a line of beauty products, the Kevyn Aucoin Collection, which he was launching on the Web site. "In typical Kevyn fashion, he was doing it his own way," said Vogue's Astley. "He was a brand and he was only going to get bigger and bigger." Aucoin is survived by his partner, Jeremy Antunes; parents Thelma S. and Isidore A. Aucoin Jr.; brother Keith; and sisters Carla and Kim. Funeral arrangements are pending. Donations can be made to the Hetrick Martin Institute, a New York center for gay youth, at www.hmi.org on the Internet. My name is Casey Stratton and I have always looked to the dent for the latest Tori info. I have never, however, had occasion to e-mail you personally until now. I too was shocked and deeply saddened by the death of my friend Kevyn Aucoin. I would like to share with you and the dent community a story about the beautiful human being Kevyn was. I am a singer/songwriter/recording artist and have always listed Tori as my number one influence. At 15 when I picked up "Little Earthquakes", my journey with Tori began- like many others. We know how that story goes. In 1998 an executive who worked at Sony (where I was in negotiations at the time) sent my CD to Kevyn Aucoin in New York. I received a call from him a few days later. Of course I was stunned and very excited and honored that he found a friend in my music. Almost immediately he asked "Stop me if I'm way off base, but do you like Tori Amos because your music has an echo of her style in it at times". I confirmed his observation and we began talking about his relationship with Tori and sufficed to say he ADORED her. He talked of times he spent with her in Florida listening to rough mixes of "From the Choirgirl Hotel", her latest release at the time. We discussed how brilliant Tori and her new album were. He asked me if my manager and I would like to have dinner with him when he next came to Los Angeles. Who was I to refuse that kind of proposition? He had wooed me with his Tori Stories- what can I say? So a few weeks later we met for dinner. Well imagine my shock when he said to me " I have to tell you something! I played your CD for Tori a few days ago and she loved it. In fact she had her manager come in from the next room to listen to it.". About 5 minutes later when I regained my composure and use of my muscles again, I proceeded to thank him from the bottom of my soul for doing that for me. He said he knew it would mean the world to me and he was glad to do it. I mean, to find out that Tori, who I respect infinitely, would give me a compliment was like a dream come true, a fairy tale. Kevyn and I spent the rest of the evening discussing music and life and the usual things, and found we had a lot in common. He truly was an amazing and giving person. Last October 11th, Kevyn got me tickets to see Tori in New York. I hadn't seen him in a while and had no idea that would be the last time I would see him. It was nice to catch up, and that night he made the other half of my dream come true. Along with my tickets were 2 backstage passes. So after the concert, Tori and I had our first chance to talk about music in person... My adrenaline rush lasted for about a week after. And it was all because this man, Kevyn Aucoin, took the time to help an unknown artist meet his idol. How many successful people in this world would do such a thing? That night, Tori and I also talked about what a special person he truly was. She loved him deeply and her recent quote is so touching. Well, it may only be one small story, but it changed my life. I have Kevyn to thank for that because he never considered himself above anyone else, and no matter how successful or busy he was, he always took the time to talk with me. We all have many things we could learn from the example of his time on this crazy planet. So here's to Kevyn...a man who may have brought out other's beauty for a living, but was intrinsically beautiful on so many levels himself. Events in the beauty world  that comfy, familiar haven of lip glosses and blushers  rarely have any wide-reaching reverberations. But last Tuesday, when the makeup artist Kevyn Aucoin died of a rare pituitary condition at age 40, the news resonated beyond cosmetics counters and out into the larger bailiwick of style. The beauty industry had lost a star. Arguably, it had lost its only star. While the world of fashion is rife with designers who are household names, standouts in the beauty business are less common. Nonetheless, in the 18 years that Mr. Aucoin daubed and defined celebrity faces, he managed to achieve unusual renown. "There's Kevyn and there's everybody else," said Jeanine Lobell, the creator of Stila cosmetics. "Way Bandy was famous, but only to insiders. People know Max Factor and Bobbi Brown, but only because they have product lines. Kevyn was the first to become a household name without positioning himself as a household brand. He did not do it with packaging. He built his fame with just his two hands." Mr. Aucoin commanded a day rate of $6,000 to $7,000 for magazine shoots, movie publicity and awards galas, and his client roster was chockablock with celebrities, many of whom would pose for the covers of Vogue or Vanity Fair only on the condition that he do their faces. "When he did makeup, it was kind of magical," the actress Nicole Kidman said. "He would look at you and say, 'Oh, I know exactly what to do,' and in the space of five minutes he'd give you red lips and put a tiny smudge around the eyes, and pat something on your nose and cheeks, and you'd be transformed. You'd think, 'Can I do this?' and of course you couldn't. So after that, it would always have to be Kevyn." Simultaneously tell-all and how-to, Mr. Aucoin was as comfortable discussing his own adolescent identity struggles as he was explaining exactly how to get maximum effect from mascara. In his role as populist beauty guru, he worked to diversify the conventions of makeup, pioneering the natural look and urging women to show off their unique features rather than hide their flaws. In his 1994 book, "The Art of Makeup," he cited Barbra Streisand as his childhood beauty ideal because "she wasn't a Barbie doll." "Kevyn was all about reaching out and making sure people felt included, no matter who they were," said the actress Hilary Swank, who became friends with Mr. Aucoin after he saw her movie "Boys Don't Cry" and impulsively phoned to tell her how much he liked it. "He didn't turn anyone away." He made her up as a feral Raquel Welch in his last book, "Face Forward." "He never did the same makeup on me twice," recalled the model Amber Valletta, who was transformed into Clark Gable and Carole Lombard in the same book. "He could somehow sense the growth and change that was going on inside you and move with it. There wasn't any one patented technique that he used over and over. It was as if he could tap into your spirit and transform you into your dream." It was Mr. Aucoin's ability to intuit and interpret the essence of his clients that enabled him to connect with them so viscerally. In a competitive market, Mr. Aucoin shared the tricks of that trade in magazines, in books and on Web sites. Beauty was his science; putting that science within reach set him apart in the glamour business. Liza Minnelli, who last saw Mr. Aucoin at her wedding to David Gest on March 16, when he did her makeup, recalled: "He shared everything. He always told me you can't take it unless you give it away. He did a lot of giving away to everybody." Any woman who has ever felt the quick little thrill of spinning open a fresh lipstick knows that cosmetic products can feed a certain hunger, the hunger to feel special and pretty. If the fashion world is about aspiration, the beauty world is about hope. That was Mr. Aucoin's trade. "He made you feel like anything was possible," said Charlie Green, a makeup artist who assisted Mr. Aucoin at the start of her career in the 1990's. "I remember standing backstage, watching him do the models. He had these great big hands. He could practically hold your entire face in one of them. But he had a special touch. He made women feel confident. He made them feel safe."